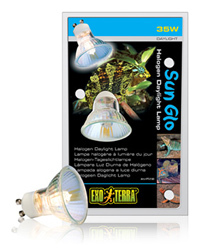 The Exo Terra Sun Glo Halogen Daylight Lamp is a broad-spectrum halogen bulb designed to emit a more natural light. Halogen emits higher amounts of UVA rays, contributing to the physiological well-being of reptiles. It also offers an increased level of infrared penetration for optimal thermo-regulation. Bought 2 bulbs, 1 blew after a week. Disappointed as they are not cheap. Blue Lizard Reptiles reply: These generally last for quite some time. If you are finding bulbs are blowing quickly it would be worth checking the fitting, as this can sometimes cause this to occur.